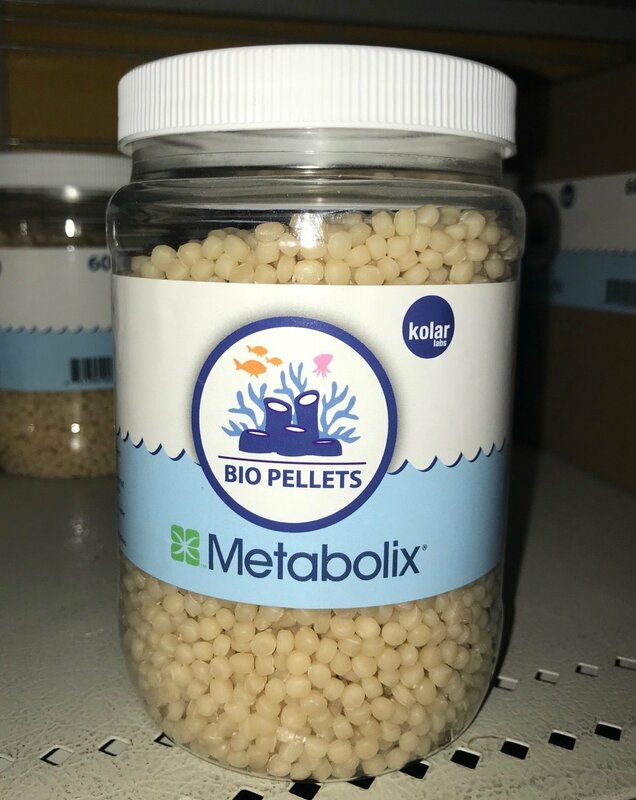 KOLAR FILTRATION IS THE GLOBAL EXCLUSIVE DISTRIBUTOR FOR THE ORIGINAL METABOLIX BIO PELLETS MADE FROM PURE HIGH QUALITY PHA. KOLAR FILTRATION MANUFACTURES THE PATENTED PELLETS FROM THE PHA OURSELVES, ADHERING TO VERY STRICT QUALITY AND PURITY STANDARDS, CREATING THE PLUMP ROUND PEARL SHAPED PELLETS THAT HAVE BEEN PROVEN TO FLUIDIZE THE BEST, WITH MINIMAL FLOATING OR CLUMPING. *RECOMMENDED: Recirculating reactors have become very popular and effective at controlling the power of the Bio Pellets, by controlling the flow through the reactor directly into protein skimmer, you can allow trace levels of nitrates to remain, potentially helping the colors of SPS corals and others, while tumbling the pellets strongly within the reactor at any flow rate, eliminating clumping, bio film, or break in problems. Simply increase flow through to reduce nitrates to desired level. • 1) Standard dose for new or exceptionally low nutrient tanks is 180g. or approximately 1 cup, per 50 gallons in a fluidized reactor. For aquariums with measurable nitrates, 1/2 to even 1/4 starting dose is recommended for first 3-4 weeks, increasing weekly thereafter. Once system is established, overdose is not possible. • 2) Add or replace Bio Pellets as needed to keep reactor full. Pro tip: do not let pellets dissolve to below 1/2 the original amount or you may notice reduced effectiveness. • 3) For best results, water exiting Bio Pellet should flow directly into a quality protein skimmer intake. Pro tip: Remove all sponges before and after media in reactors and replace with plastic mesh to prevent clogging. Add small check valve to pump side of water line/keep return line submerged, to prevent back siphoning into pump in a power cut. • 4) Rinse and soak new media, in D.I. or tank water for up to 24 hours to prevent floating. If reactor gets clogged, dump contents into 5-gallon bucket with tank water, stir and poor off debris. Media can then be returned to reactor in part or whole. Keep pellets moving within reactor to prevent clumping or clogging. Pro-tip: Tiny air bubbles can stick to new pellets, causing them to float initially, watch for floating pellets against top screen after new media is placed in reactor, gently tap on reactor, or stop and restart the pump, to get Pellets to fluidize and prevent clogging. • 5) Keep significant aeration in aquarium system, especially at night during first 3-4-week cycle period. Use Protein skimmer, aggressive surface agitation, and/or air bubbles, to keep O2 levels up and allow for CO2 removal. • 6) Aquariums with measurable Nitrates above 20-40ppm, Monitor and watch for reduced PH, buffer to increase PH if necessary. Many bacterial additives are available to help prevent initial bacterial blooms. Watch for initial cloudiness during first 4 weeks, indicating a bacterial bloom. If substantial cloudiness occurs, reduce quantity of pellets by 1/2 and do water change. Recirculating reactors with efficient protein skimmers, reduce or eliminate these potential problems!